The horror anthology and love letter to B-movies is bound for Blu-ray in November. 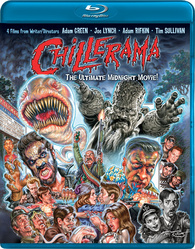 In an early announcement to retailers, Image Entertainment is working on 'Chillerama' for Blu-ray on November 29. From the depraved minds of directors Adam Rifkin ('Detroit Rock City,' 'The Dark Backward'), Tim Sullivan ('2001 Maniacs,' VH-1’s “Scream Queens”), Adam Green ('Hatchet,' 'Frozen'), and Joe Lynch ('Wrong Turn 2,' 'Knights of Badassdom'), 'Chillerama' is a festival of gore, guts, goofiness and good times. Produced by ArieScope Pictures and in the spirit of classic “omnibus” films like 'Dead of Night,' 'Tales From the Crypt,' 'Creepshow' and 'Twilight Zone: The Movie,' with four vignettes that not only celebrate the golden age of B horror schlock but also nearly the entire history of horror cinema itself, 'Chillerama' offers something for every bad taste. With titles like “Wadzilla,” “I Was A Teenage Werebear,” The Diary of Anne Frankenstein,” and “Zom-B-Movie,” 'Chillerama' features appearances by Joel David Moore ('Avatar,' 'Hatchet'), Lin Shaye ('Insidious'), Ray Wise ('X-Men: First Class'), Kane Hodder ('Hatchet' and 'Hatchet II'), Eric Roberts ('The Dark Knight,' 'Sharktopus') and more cameos than one can (body)count. It's the closing night at the last drive-in theater in America and Cecil B. Kaufman (Richard Riehle, 'Bridesmaids,' 'Hatchet') has planned the ultimate marathon of lost film prints to unleash upon his faithful cinephile patrons. Four films so rare that they have never been exhibited publicly on American soil until this very night! What could possibly go wrong? The Blu-ray will feature 1080p video, a DTS-HD Master Audio 5.1 soundtrack, and the disc will include: Directors' Video Commentary; Wadzilla Deleted Scenes and Trailer; The Making of The Diary of Anne Frankenstein featurette; I Was A Teenage Werebear Behind the Scenes, Deleted Scenes, and Trailer; Zom-B-Movie Deleted Scenes; Directors' Interviews; and Original Theatrical Trailer. You can find the latest specs for 'Chillerama' linked from our Blu-ray Release Schedule, where it's indexed under November 29.